who opt for equal partnership, who reject wars as contrary to the very essence of life and the nature of man. President Putin made an announcement during Wednesday’s press conference following a meeting with the Italian Prime Minister. “As for the results of the visit of Foreign Minister Lavrov to the United States and his meeting with President Trump, we consider it to be successful. This was a return visit of our Minister of Foreign Affairs after the Secretary of State Tillerson’s visit to Moscow. This is a natural and normal international practice. At the same time, we see that in the United States is currently developing the form of political schizophrenia – this is the only way I can explain the charges levied on the acting US President alleging that he revealed some kind of secrets to Lavrov. By the way, today while discussing this issue with Lavrov, I had to issue him a warning, because he had not shared any secrets neither with me, nor with the representatives of Russian security services. This is very bad on his part. Moreover, if the United States administration will find it possible, we are ready to provide a record of the conversation between Lavrov and President Trump to the Senate and Congress of the United States. Of course, if the U.S. administration wants it. Initially, when we were watched the process of political struggles developing in the U.S. it made me laugh. What’s happening today, it is not just sad, it’s a carouse of a great concern, because what else can we think of people who generate such nonsense, such nonsense… it is hard to imagine. All this is done to incite anti-Russian sentiments. I know what surprises me the most. They are destabilizing the political situation in the United States under anti-Russian slogans. They either don’t understand that they are bringing harm to their own country, in this case they are just stupid, or they understand everything, and in this case they are a dangerous and unscrupulous people. Like with any full blown hysterical feats orchestrated by the corporate media and some of the U.S. politicians, the matter concerns Israel. Israel is an “ally” behind the terror threat of using the laptops to take down civilian aircraft. Israel is furious because it was something they planned for some time. Israel has the technology to remote control airliners via laptops. There have been rumors circulating in Russia prior to this meeting that Israel was instrumental to the crashes of Russian airliners, and that they are using the Islamic State as a cover for their operation. Trump mentioning this terror threat to Lavrov that confirmed that was already known. Any terror attack on the Russian passenger flights would directly point at Israel. Here is the brief to the point post, Did Trump “Accidentally” Save The World?. Thanks the Kulak for sharing the link. Trump is officially most courageous and decent politician the US ever produced. John Helmer pinpoints the exact locations where the US authorities admitted their cooperation with the Islamic State in targeting Russia, but he stops there without mentioning Israel even once. 2. That Israel provided secret intelligence about the planned attacks on the Russia airlines was reported by all of the major corporate media outlets from New York Time, to Haarez. The kind of information that Trump is being alleged to leaked to the Russian, he didn’t have. Whoever leaked the information about Trump talking to Lavrov about the possible terror attacks by the Islamic State that “somehow” found a way to turn laptops into bombs, leaked more details to the Washington post than Trump was briefed on. WaPo got played by its sources. The information given to WaPo contains far more intricate details that Trump was ever told. This is why so much is absolutely freaked. I remain convinced that the neo-cons are freaking out because it’s a major exposure of Israel plotting the terror attacks against Russian civilians, using the bearded rascals as a cover. My deepest gratitude to those who bought my book. Those who have not done this yet, please, do. By buying my books you are supporting my ability to dedicate time and effort to my research and writing here on the Vineyard of the Saker. Jim of Olym on May 13, 2017  ·  at 1:40 am UTC I hate Amazon! How can I get the book otherwise? We are deliberating on setting up the Saker’s book store. However… as much as I share your sentiments about giant supranational corporations, consider our books being on Amazon’s book store display, as the PR for our community, and our fight to break the neo-con hold on all Russia related information. 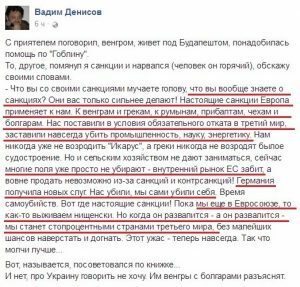 Type “Russia,” “Russian humor,” or “Russian politics” and you can find hundreds of titles written by Russophobes, books containing pure unadulterated, hateful lies. Having amongst them the Saker’s books, and also mine and Auslander’s books is like having Russia’s soldiers deep behind the enemy line. Amazon promises 70% from ebooks sales minus 5 cent for delivery. It comes to about $7 per unit. Amazon promises 60% from the paperback sales minus $3.68 for copy printing costs. It comes to about $4.50 per unit. It looks like 33 ebooks and 14 paperback were purchased by my readers. Since, about 100 copies of previous book was purchased, I would like to think that I should sell at least as much copies of the Anthology of Russian Humor. You should know that YouTube recently practically demonetized independent media channels. The neo-cons can go after all sources of independent media finances, but, as of today, they cannot go after your wallets. This is something you control. To ask you to buy a couple of books a year for #9.99 is not that much to ask, but it means the difference from writing for you or working someplace else to pay bills. 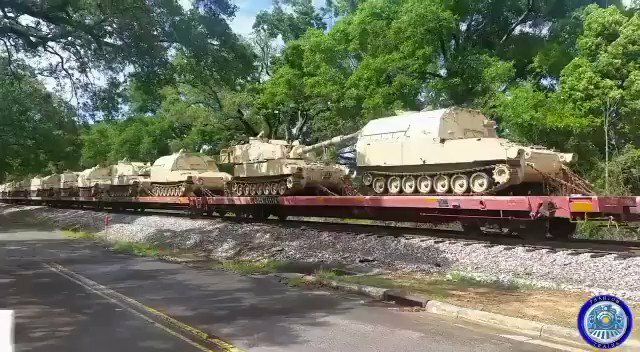 Ex Army eyewitness says 4 trains carrying an entire armored brigade were headed to South Florida for the Atlantic (port of Charleston or Savannah) most likely for a deployment to Europe. President Putin keeps calling on the US to reduce the level of its military preparation for a world war. “Life itself demands from us that we must increase our defense potential. However, the consolidation of the world community is needed for an effective fight against terrorism, extremism, neo-Nazism and other threats. The liberal media posted beautiful images of the parade and reported “Vladimir Putin warned the world his Russian army can ‘repel any potential aggression’”. Not a word was said about Russia’s President’s appeal for peace. Writing about the NATO preparation for war, I stressed “military” because there are no attempts to prepare the civilian population for an inevitable massive collapse of services and systems, like food, water, fuel, and medicine supply, electricity and phone services. The list goes on and on. Strictly speaking neither the U.S. government, nor its NATO allies have prepared their populations for a nuclear war. If you don’t believe me, just approach your local representative with an innocent expression on your face and ask how your state or province is prepared to assist the population in case of the direct nuclear strike. All you will get is a dumb look. The absence of such preparations creates a delusion that since the governments don’t do anything while concentrating more ships and tanks on the Russia’s borders, is because this upcoming war will be contained to the Russia’s territory, and the countries like the U.S. Canada and Australia would never even know that it took place. All they have to do is to wait for a few years, and then go and take all the Russia’s wealth, just like they all collectively thought in 1941. They too miss the simple truth that their governments don’t plan in saving their populations at all. This is not the first time when President Putin talks about extremist ideology as being the driving force behind enormous human sacrifices. Putin’s liberal critics rush to suggest to you that what he means under “false ideology” and “extremist ideology” are the ideas of Marx, Hitler, Trotsky or al-Wahhab, but he never names this ideology and it’s clear from his speeches that he always talks about the same ideology, and not its different manifestations. President Putin’s speech at the One Belt, One Road international forum on May 14th, contains the same message that peace is sustainable with the involvement of all the nations. ” I would like to stress that Russia does not simply view the future of the Eurasian partnership as the mere establishment of new ties between states and economies. This partnership must shift the political and economic landscape of the continent and bring peace, stability, prosperity and a new quality of life to Eurasia. Understandably our citizens need security and confidence in the future and the opportunity to be productive and improve the wealth and well being of their families. It is our common duty and responsibility to ensure they have these opportunities. I have never felt such respect and love to anyone outside of my immediate family, as I feel about Vladimir Vladimirovich, probably because I feel that he has a deep, profound, truly Christian love for people. During a recent visit to the Russian Geographic Society, Putin commented on a footage of an Arctic sea angel (Clione limacina) devouring an Arctic sea devil, “A sea angel eats a sea devil? This is what I do at work,” he said. A glimpse into his worldview. Take it for what it’s worth. Very soon someone who is trusted and liked by many people will address millions of people simultaneously and, using carefully chosen words, will deliver the following message: humanity is heading into an abyss being led there by a militant omnicidal cult. This cult’s members are people of different ethnicities, nationalities and races, who live and operate in nearly every country on earth, while being tightly connected to each other. Driven by their mistaken extremist ideology, they harbor a false believe that they have been called by their deity to exterminate humanity. They do everything in their power to holt any development of human race, and any scientific progress. To do everything in their power to turn into dust cultures, arts and religions. Using never ending wars they are erasing from the face of the earth entire nations every day. By occupying and uniting countries into one supranational entity like the European Union, they manage to push back the progress of the Western European nations by hundreds of years, and in many ways, forever. “I spoke recently with an old pal of mine. He is a Hungarian and lives near Budapesht. We were talking about all kinds of things, and I mentioned the sanctions. the following is his tirade: “What do you know about sanctions? Get them out of your head. They only make you, Russians, stronger. The real sanctions are those that Europe imposes on us. On Hungarians, Greeks, Romanians, the Baltics, and on the Czechs, and Bulgarians. This was my conversation for a book I am writing. Chinese use the term baizuo, or literally, the ‘white left’. The Russian Investigative Committee has launched criminal cases against Ukrainian servicemenand officials responsible for indiscriminate use of artillery in the self-proclaimed Donetsk Republic that resulted in civilian casualties. The alt-right shows up in Charlottesville, Va., chanting “Russia is our friend” near statue of Robert E. Lee. Protesters, including white nationalist Richard Spencer, were carrying torches. Mayor compares it to a KKK rally. Police said the crowd quickly dispersed with no further incidents after authorities arrived. Why would Russia need foreign sexual perverts and political extremists as heads of educational and religious organizations? An interesting investigation into the background of a current “scandal” in the wake of a court decision to extradite back to Israel yet another rabbi. A rabbi, featured here in hot pants. The US run secret bio-chemical labs in Armenia threatening the health and even existence of this small nation. Why would Yerevan allow the US Department of Defense to set them up? The US Department of Defense established and run those secret labs neat cities with million and more population like Odessa and Kharkov in Ukraine, Alma-Ata in Kazakhstan, Tbilisi in Georgia, and also the earthquake prone regions in Armenia near its capital Yerevan, near Gyumri, the second large city in Armenia and near Ijevan, a geographical center of Armenia. The US government spends officially $150 million to build the biochemical labs in Georgia, and $130 million in building similar centers in Armenia. Needless to say that at any moment the US military can use these centers to blackmail the governments under the threat of infecting the entire population. 2. The UK Embassy in Yerevan conquered decency and sanity by raising the flag of gays. In a response, angered Armenians displayed the IRA banners. Question: Is this a signal that the sexual minorities are being made into a sovereign nation? Featured image: Crimea in bloom, photo by Valeriy Indyukov, Ufa.